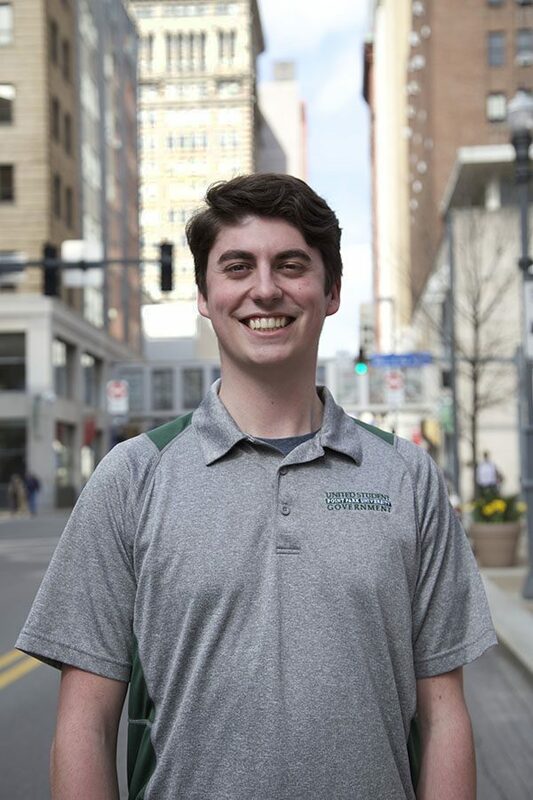 Robert "Bobby" Bertha is a junior Broadcast Production and Media Management major from West Deer, Pa. who has served on USG for 2 years as both a Senator at Large and Vice President. Point Park’s United Student Government is holding elections for all of its positions April 3 to 7. Last week, the Globe profiled the candidates for Vice President, Kristopher Chandler and Davion Heron. We continue the series this week with profiles of the candidates for USG President: Robert Bertha and Charles Murria. United Student Government (USG) Presidential candidate Robert Bertha is looking to shake up the way things are done around campus. Bertha, who goes by Bobby, said that he knows how to communicate messages to students in an appropriate way. Currently a junior, Bertha has been at Point Park for two years and has been involved with USG since he transferred to Point Park. Bertha previously attended the Community College of Allegheny County and Pitt-Johnstown. USG elections are being held April 3 through April 7. Running against Bertha is fellow junior Charles Murria. Bertha joined USG in his sophomore year after transferring from Pitt-Johnstown and has served as a senator and as the Vice President of USG. Bertha contacted USG President Blaine King during his sophomore year and was appointed to the position of senator. Bertha became Vice President last spring when he ran uncontested, although he said that he welcomes competition in this upcoming election. Bertha has worked diligently on campus to make sure that things get communicated clearly on campus for students. Working not only with the administration, but also with CulinArt, Bertha said that he wants to students to be aware of what is going on and feel comfortable on their own campus. Growing up in West Deer, Pa., Bertha is not far from his hometown and sees the importance of working with those around him. He said that he loves doing work with USG because he wants to give back to the community that he lives in. “My first day at Point Park, I was literally welcomed with open arms,” Bertha said. Bertha said that communication is the biggest problem USG faces when battling student and campus issues. A better relationship between the student body and the administration is what Bertha said he would strive for as president. “I don’t want it to be always a last-minute email telling students of a change, but more of an advanced notice,” Bertha said. USG meetings are held open to the student body, but Bertha said he wants to slightly change that. Bertha wants to implement more town hall-like meetings for students to voice their opinion to the USG and possibly administrators. If elected, Bertha would like to see this happen as quickly as possible. Along with these meetings, Bertha’s vision includes having the USG senators do outreach meetings. USG’s biggest public events are the annual forum and Pioneer Community Day. Bertha said he wants the public of Point Park to know the faces of USG and have them be more involved on campus with the students. Bertha said that he also wants USG to be more approachable for students. He said that he wants people to be able to come up to him around campus and pitch their ideas to him without them being scared. Bertha has taken his position and time here at Point Park very seriously. “One of my goals is to create and foster a community of transparent and clear communication between the university administration and the student body,” Bertha said. Bertha said that this is in part due to his recent work as a resident educator. Students often come to Bertha in the middle of campus and talk with him about issues and suggest ideas. Bertha said that USG needs to be easily approachable. Outside of USG, Bertha is a broadcast production major and co-producer of NewsNight on U-View. Bertha began broadcasting in middle school, but more importantly, started taking on student government responsibilities at that time, too. Those who have known Bertha know that he attended Deer Lakes High School and that his time there has helped mold him into the student politician he is. “There wasn’t a person in our entire high school who didn’t know his name, who didn’t know his face,” senior multimedia major Emily Yount said. Yount has known Bertha since middle school, where they both made an impact on the school during their time as student council members. Yount said that because of them, the high school created a new class out of producing the morning announcements. “He’s one of those people that can read a room; he can get along with everyone,” Yount said. Among other roles, Bertha is a resident educator in Pioneer Hall. Bertha’s roommate, current USG president Blaine King, said that Bertha takes on the role of an RE very well. “He does his job with no complaints. He carries himself very well,” King said.